Looking to make a statement in your home? 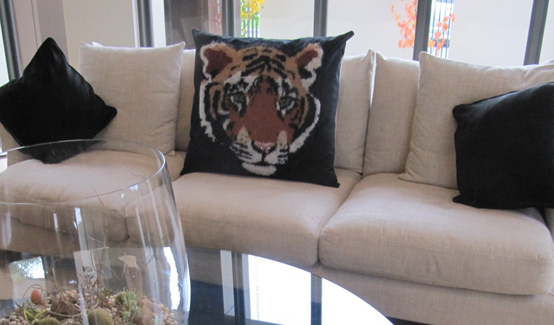 This large tiger head cushion is unique, bold and eye-catching. Be captivated by the eyes of the tiger, and the wonderful soft feel of the hand knitted mohair tiger head. These items are extremely rare and desirable. The cushion has a hidden velcro fastener to enable the cushion cover to be easily removed for washing. The tiger head is made from: Mohair (78%), Wool (13%) and Polyamide (9%). The cushion size is approx. 32" x 26" (815mm x 660mm). Part of our Pet Collection designer cushion range, the Labrador, adoringly looking at its owner, is uncannily realistic, and beautifully handmade in the UK. You will be mesmerised by its engaging face and its eyes. The cushion, made from a luxurious green velvet, has a hidden velcro fastener to enable the cushion cover to be easily removed for washing. The labrador is made from: Mohair (78%), Wool (13%) and Polyamide (9%). The cushion size is approx. 26" x 26" (660mm x 660mm). Part of our Woodland Collection designer cushion range, the Fox, staring from its lair is uncannily realistic. Beautifully handmade in the UK, you will be mesmerised by its eyes. The cushion, made from a luxurious green velvet fabric, has a hidden velcro fastener to enable the cushion cover to be easily removed for washing. The Fox is made from: Mohair (78%), Wool (13%) and Polyamide (9%). The cushion size is approx. 20" x 20" (510mm x 510mm). Part of our Wildlife Collection designer cushion range, the Panda, looks cute and uncannily realistic. Beautifully handmade in the UK, you will be mesmerised by its engaging face. The cushion, made from a luxurious rust velvet fabric, has a hidden velcro fastener to enable the cushion cover to be easily removed for washing. The Panda is made from: Mohair (78%), Wool (13%) and Polyamide (9%). The cushion size is approx. 18" x 18" (460mm x 460mm). Part of our Wildlife Collection designer cushion range, the Leopard immediately makes a positive impact on any room. Uncannily realistic, and beautifully handmade in the UK, you will be mesmerised by its engaging face and eyes! The cushion, made from luxurious green velvet, has a hidden velcro fastener to enable the cushion cover to be easily removed for dry cleaning. The leopard head is made from: Mohair (78%), Wool (13%) and Polyamide (9%). The cushion size is approx. 26" x 26" (660mm x 660mm). Part of our Woodland Collection designer cushion range, the Hare is beautifully hand made. You can be assured of originality as no two cushions produced look exactly the same. The cushion, made from a luxurious green velvet fabric, has a hidden velcro fastener to enable the cushion cover to be easily removed for washing. 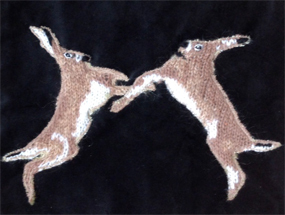 The Hare is made from: Mohair (78%), Wool (13%) and Polyamide (9%). The cushion size is approx. 18" x 18" (460mm x 460mm). Part of our Pet Collection designer cushion range, the Kitten in a Basket, playing with a ball of wool is so cute and uncannily realistic. Beautifully handmade in the UK, you will be mesmerised by its engaging face, especially its eyes. The cushion, made from a luxurious light green velvet, has a hidden velcro fastener to enable the cushion cover to be easily removed for washing. The Kitten is made from: Mohair (78%), Wool (13%) and Polyamide (9%). The cushion size is approx. 20" x 22" (510mm x 560mm). Part of our Pet Collection designer cushion range, the Yorkshire Terrier is uncannily realistic, and beautifully handmade in the UK. You will be mesmerised by its engaging face and its eyes. The cushion, made from a luxurious green velvet, has a hidden velcro fastener to enable the cushion cover to be easily removed for washing. The Yorkshire Terrier is made from: Mohair (78%), Wool (13%) and Polyamide (9%). The cushion size is approx. 18" x 20" (460mm x 510mm). Part of our Woodland Collection designer cushion range, the Little Owl in flight is beautifully hand made. You can be assured of originality as no two cushions produced look exactly the same. The cushion, made from a luxurious black velvet fabric, has a hidden velcro fastener to enable the cushion cover to be easily removed for washing. The Little Owl is made from: Mohair (78%), Wool (13%) and Polyamide (9%). The cushion size is approx. 18" x 18" (460mm x 460mm).